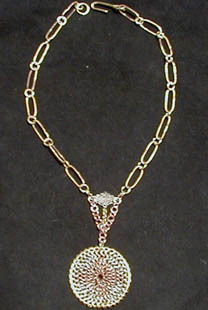 The chain for this necklace was made out of brass, and the oval links are soldered. 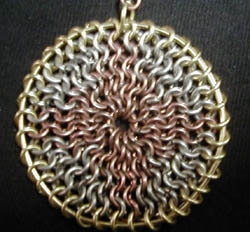 The pendant was made out of 1/8id brass, copper/steel alloy and stainless steel. 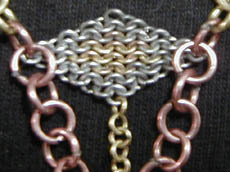 The small tapestry that is above the pendant is shown. The tapestry only has 72 links and it took over 4 hours to make, still it is about the size of a dime. It was made of tweezermaille, and the links were made by coiling wire around a 16ga rod. To the right is shown a links relative size.